The WellnerBOX is a preventive all-in-one security and surveillance solution, designed for permanent outdoor use, 24 hours a day, 365 days a year. With its unique TOP features: false alarm reduction, live response and virtual guard tours, it supplements and expands the possibilities of security protection / security service providers / police in an uncomplicated way and has already been securing construction sites, storage areas and supply facilities of all kinds for many years – throughout Europe. 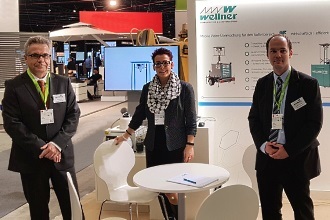 We present at the BAUMA 2019 in Munich our newest model, the WellnerBOX „mobil“, lightweight, flexible and powerful, ideal for the special requirements of data-protection-compliant construction site monitoring, the perfect solution for preventive theft protection. We will be at your disposal at BAUMA 2019 from Monday, 08 April, to Sunday, 14 April, between 09:30 and 18:30 hours. We look forward to an interesting exchange of views. Arrange your desired appointment now using the form below. We will contact you shortly for a binding confirmation. For which trade fair day would you like to make an appointment?